Each year we choose two women out of a handful of applications that want help to transform their lives into a fitness-oriented one. We always look for something a little different each year. This is our way of giving back to the community and helping those that maybe are unable to purchase a “makeover” package full of 1-on-1 personal training, nutritional guidance & more! Okay, if anyone knows me, you know that this SCREAMED my name!!! So I sent in my application. In 300 words or less – tell us about yourself? Forget fitness for a second – and tell us a little more about your life – occupation, hobbies, etc. I am a single mom and a teacher. I teach 5th grade English, and I love what I do. My son is 8, and my hobbies involve all the sports that he is active in. He and I play catch and basketball in the front yard. I started working out in January, and my hobbies have changed since then. I love to spend time with the girls (and a few guys) from the gym running or doing races. I love mud runs the most! It’s fun to get dirty and play in the mud. I love my new facebook page too. It’s amazing to connect with like-minded people about something that I am becoming so passionate about. I am inspired by people who tell me that I inspire them. It fills me up! I also enjoy sports. I love watching or attending Rays games or Bucs games. Sports have always been a part of my life. It’s hard to forget fitness in my hobbies because there is so much in my life that has changed lately due to fitness. I don’t want to be a spectator for the rest of my life. I want to be an active participant! If you had unlimited access to a Trainer – what goals would you have? And how would you go about achieving them? I would love to have a trainer to push me further than I think I can go. I think that is what holds me back more than anything. The voice in my head still tells me that I can’t do things. I need that push to prove that I am stronger than I think. My number one goal would be to conquer that voice in my head. I also need to be accountable. I am at my best when there is someone there, calling me out when I am not pushing as hard as I can. I also need that push to make sure that I get my workout in and eat right. I have this drive in me, and I know that I will be successful! I have journaled my food before and I know the benefits of that. I want to tone my body and have Angela Bassett arms. I have a good muscle base, but it is covered up by fat. I am slowly peeling away the fat, but I know I can do better. I would love a trainer to design a plan to get me where I need to go. I would get there! I know that!!! I will take the next 3 months and dedicate myself to getting it done. I would also take any and all nutrition advice that I can get. I need help in this area. I have cut out things that are not good for me, but there are still issues with my diet that I know I am messing up. What distractions do you have in your life that will deter you from reaching your goal? My biggest distraction is my son. He is very active and has quite a few extra curricular activities, but my mom and I just had a talk. She has agreed to help me get him to the places that he needs to be and do everything that she can to help me achieve my goals. Work can be a distraction too if I let stress take over. I am confident that stress will be fine as long as I continue working out. I am dedicated! I want to be better. I want to be fit. I want to change my life, but more importantly, I want to be an inspiration to others. I want to share my journey with the world. I have a facebook page with over 1100 likes and twitter with over 400 followers, and I plan to touch as many lives with my story that I can. I want to be a better mother. I want my son to see the importance of healthy eating. I didn’t grow up with that, and even though I had the best childhood and I have the best parents, we didn’t eat healthy. I want my son to grow up understanding the benefits of healthy living. I want to inspire him to pass his knowledge on. I want to be a role model for teachers. A lot of teachers struggle with their weight, and I want teachers to know that this can be done. I am almost 40 years old. I don’t want to live my next 40 years the way I have lived my first. I want to be better, stronger, happier, and healthier. You should choose me because I will be able to keep an electronic journal of this journey on my facebook page and through blog posts. I will succeed! I want this! You should choose me because I will make you proud! I am sharing this with you now as #PROOF! I will have the strongest 2 months of my journey thus far! I hope you all will stay around and watch! You totally ROCK girl! You are ON FIRE! Keep up the awesome work! 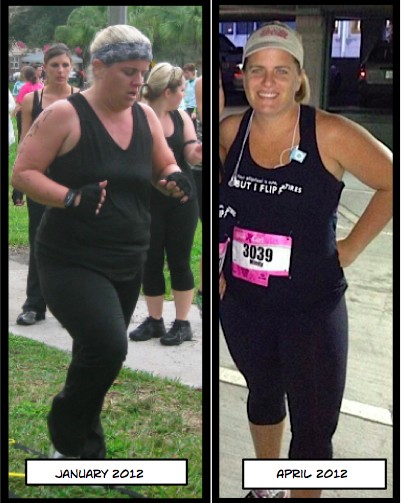 I'm amazed by your transformation! 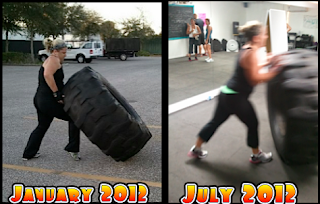 Love the pic of you flipping the tire! STRONG! Keep up the great work! Way to go! Thanks so much for sharing this with us; truly inspirational!